Questions about anything on this page - or questions about any food item - should be directed to the [Food & Water] section as a new topic. Updates to this page can be made by contacting any Administrator or Moderator. What do I feed my crabs? You will read a lot of messages on this forum about the dangers of commercial foods. Most commercial foods contain preservatives and other ingredients that may be harmful to hermit crabs. Many of the members of the HCA have decided to feed their crabs an all natural diet. We have eliminated commercial foods from our hermit crab's diet. We have decided to do this because we are unsure of consequences of the preservatives contained in commercial foods. If you would like to learn more about feeding your hermit crabs a natural diet, we recommend that you read our Safe Food List and our Unsafe and Unpopular Food Lists, or join in a discussion in our Food and Water forum. What Commercial Foods Contain EQ and Other Preservatives? Jurassipet Hermit Crab Food (Ingredients:Krill meal, fish meal, alfalfa, blood meal, fish oil, beta carotene, spirulina, xanthophyll, vitamin A acetate, d-activated animal sterol (D3), vitamin B12, riboflavin, niacin, folic acid, calcium pantothenate, pyridoxine hydrochloride, thiamine, biotin, dl-alphatocopherol (E), l-ascorbyl-2-polyphosphate (C), choline chloride, cobalt sulfate, copper sulfate, ferrous sulfate, manganese sulfate, ethylenediamine dihydroiodide. Added mineral matter not more than 2.5%. Contains no soy, which can interfere with calcium adsorption. Are There Safe Commercial Foods? If you do not have the means to feed your hermit crabs an all natural diet, you may want to consider using the following commercial foods. Please note that while some of these may be called 'treats', all are safe to use as part of a regular diet. Not everyone can afford or has the time to prepare fresh foods for their crabs every day. If you are going to give your crabs commercial foods, we would recommend that you supplement the commercial food with fresh vegetable, fruits, and proteins several times per week. Thank you to Julia Crab and Epicurean-Hermit for their research. 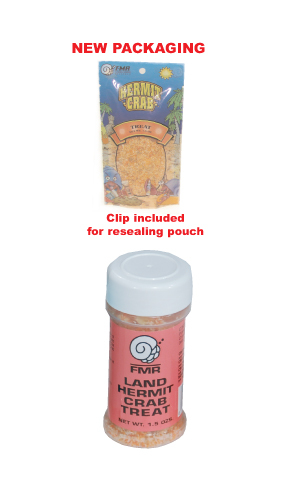 Please visit our Shopping Resources for links to stores that sell safe, all natural hermit crab foods.